Like most sci-fi and fantasy series these days, Conan The Barbarian could enter a larger cinematic universe following The Legend of Conan. Fredrick Malmberg, who just acquired the film rights to Robert E. Howard's creations like Conan, Kull The Conquerer, Solomon Kane, and more, recently told Deadline that he hopes to combine said characters into a shared universe. 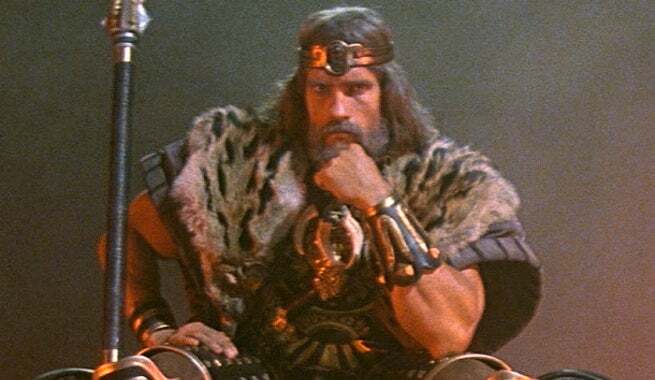 This universe would presumably start with the upcoming The Legend of Conan, where Arnold Schwarzenegger will once again don the furry boots as an elder barbarian king. After Jason Momoa’s Conan The Barbarian reboot--which Malmberg licensed--flopped, plans were put in motion to make a direct sequel to 1984’s Conan The Destroyer with Schwarzenneger. Impressed by Schwarzenegger’s recent acting in the zombie film Maggie, Malmberg thinks he could get a lot o mileage out of an "Old Man Conan" story. From there, Conan could meet up with several other of Howard's creations. “It’s 30 years after the original film, and he’s facing his mortality and how a legend deals with the fact he’s older, and how does he want to go out,” Malmberg told Deadline. Would you like to see Conan in a shared movie universe? Let us know in the comments.